I wrote about the poetry of Charles Bukowski in The Allure of Nymphets. I specifically shared a poem that he wrote about Ernest Hemingway who, like a number of artists that I wrote about in the book, was clearly an ephebophile. genius.\in between, he continued to write,\and late at night in his favorite bar\liked to talk about writing and his amorous\adventures.\actually, he was just a drunk\who liked young ladies,\ writing itself,\and talking about writing.\wasn’t a bad life. Hemingway used the Indirect approach of seduction, which is to initiate a conversation with a nymphet without letting her know your true intention. For example, Hemingway invited the nymphets to lunch to discuss literature after which they "vied to bed down" the literary genius. Hemingway's wives/girlfriends approved of his affairs with nymphets. He used the excuse that nymphets made him feel "young again", but that is exactly what that was - a lame excuse. Hemingway, like most men, was too shy to say that he was simply attracted to nymphets. Clearly, Hemingway's nymphets were not deterred by his grey, his age or the fact that he was married, which isn't surprising after reading R. Don Steele's How to Date Young Women for Men Over 35. 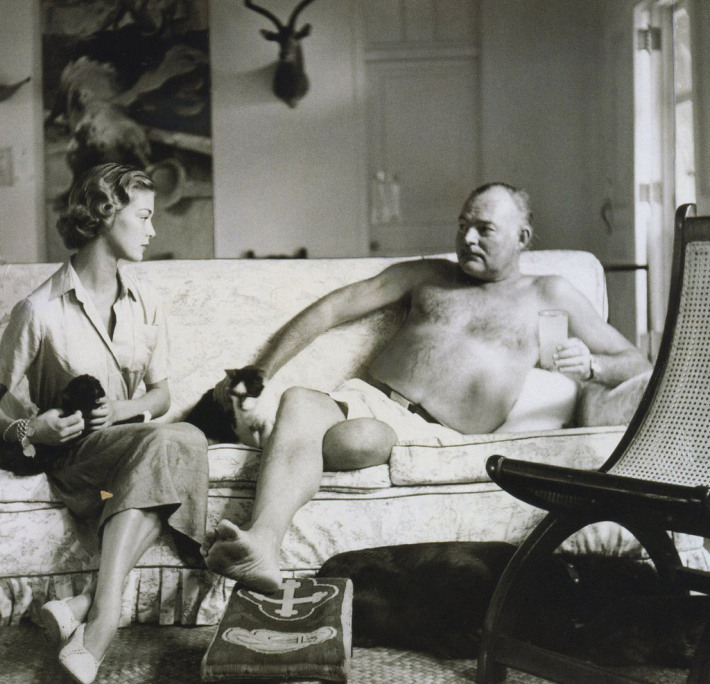 Jean Patchett and Ernest Hemingway, Cuba 1950.